Wednesday July 24, gents 18 hole medal. 1st class: 1 Alan Stewart 71-11=60, 2 and scratch, Jimmy Morrison 70-8=62, 3 Hamish Bannatyne 70-6=64. 2nd class: 1 Rueben Betley 94-27=67, 2 Colin Rutterford 86-19=67, 3 Quintin Oliver 96-21=75. Thursday July 26, Ladies Open. A total of 116 ladies played on a glorious day. The ladies were given a glass of Prosecco during the prize-giving which was generously donated. 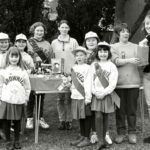 There was a raffle and £633 was raised. Our main charity this year is the Arran Mountain Rescue Team. Local businesses sponsored 12 holes and the money raised from this will be given to junior development. Many thanks to all our sponsors and to the island lady members who donated the hole prizes and to the mainland lady members who donated the raffle prizes. 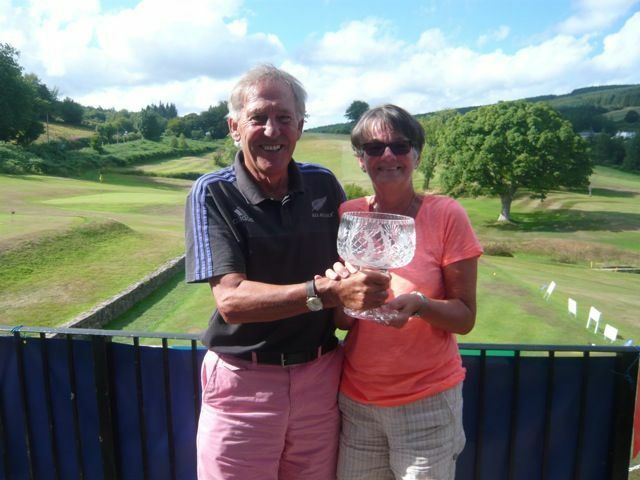 Hole winners: Hole 1, nearest the pin in 3 – Ann Lang and Elspeth Inch. Hole 2, longest drive – Ann May. Hole 3, mystery hole- Pat Adamson and Moira Small. Hole 4, nearest the pin – Lucy Wood. Hole 5, longest putt sunk – Wilma Kay. Hole 6, nearest the pin in 2 –Gillian McLeod and Shona McVey. 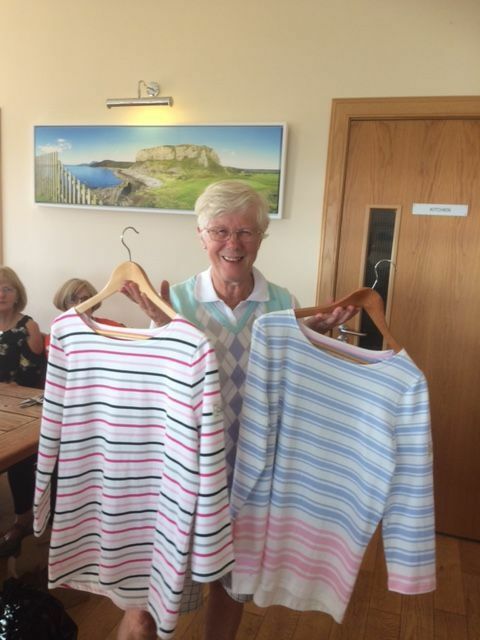 Hole 7, mystery prize – Alison Thomson and Shirley Bell. Hole 8, nearest the pin in two – Gillian McLeod and Shona McVey. Hole 9, nearest the line – Jennifer Bell. Hole 10, nearest the pin – Catherine Garrett. Hole 11, longest putt sunk – Alice Anderson and Jerry Arthur. Hole 12, nearest the pin – Jill West. Prizewinners: 1st prize, Ann Lang and Elspeth Inch – nett 36. 2nd prize, Valerie Hardie and Pam Wright – nett 39. 3rd prize, Alison Burnett and Mary Jo Tod – Net 39.5. 4th prize, Catherine Garrett and Fiona Scott – nett 40. 5th prize, Pietre Johnston and Liz Kerr – nett 40.5, BIH. Scratch prize, Shona McVey and Gillian McLeod. Least putts, Esther Henderson and Isobel MacDonald – 16. Lucky losers, Sheena Murchie and Kate McAdam. Congratulations to all the winners. Wednesday July 25, The Jim Pirie Quaich. The settled weather made for a good field of 35 competitors for this popular competition, now played as a Stableford. Scoring was good with the top six players all bettering par but CSS stayed at 63/36points. Stephen Young passed that easily to win on 41 points, just edging past Andy Martin on a countback. 1 Stephen Young 9, 41pts ACB, 2 Andy Martin 13, 41, 3 Gus Macleod 12, 39, 4 Ronnie Mann 12, 38. Magic twos, Ryan Armstrong @5th, Wolfi Kroner @11th, Douglas Graham @14th and Brian Murray, Scott Murray and Craig Simpson all @17th. As a happy adjunct to a fine day’s golf, the late Jim Pirie’s son David played and was able to present the quaich named after his father to the winner Stephen Young in the clubhouse. Fixtures: Sunday August 5, The Lifeboat Stableford Open, entry for non members is £15 including sweep and charity contribution. Wednesday August 8, The McNicol Cup. Thursday July 26, Summer Cup, CSS 66. 1 Dougie MacFarlane 65-0=65, 2 Serge El Adm 82-15=67, 3 Alan Smith 80-11=69. Scratch, Dougie MacFarlane 65. Magic twos Allan Winship @17th. Thursday July 26, Yellow Medal, CSS 61. 1 and scratch, Eugene Mitchell 70-17-53, 2 Bob Tait 87-26-61. Saturday July 28, E I Cannon charity day, 4-ball stableford, all entry fees to support Arran’s Santa Sparkle. Winners N Stewart 4, N Richardson 5, D Cameron 9 and C Tait 14, team result 86 stableford points. 2nd I Bremner 7, Alan Smith 11, Andy Smith 16 and J Henderson 19, team result 81pts. 3rd A McDonald 13, B Sherwood 14, D Robertson 18 and A Latona 21. Team result 69pts. Sunday July 29, Hastings Cup final. 1 I Bremner 74-7=67, 2 Hugh McLelland 87-18=69. Fixtures: Friday August 3, Open practice day and Dan Crawford Salver (Lifeboat Day). Saturday August 4, Lamlash Open day one (course closed) and qualifying for the Mclean Salver. Sunday August 5, Lamlash Open day two (course closed). Thursday August 9, Summer Cup, make up own games, see starter for times. Ladies Section: Monday July 23, Open mixed fours. 1 Ian and Sheena Murchie 66, 2 Alan Smith and Mary Adams 68. Scratch Ann and John May 81. 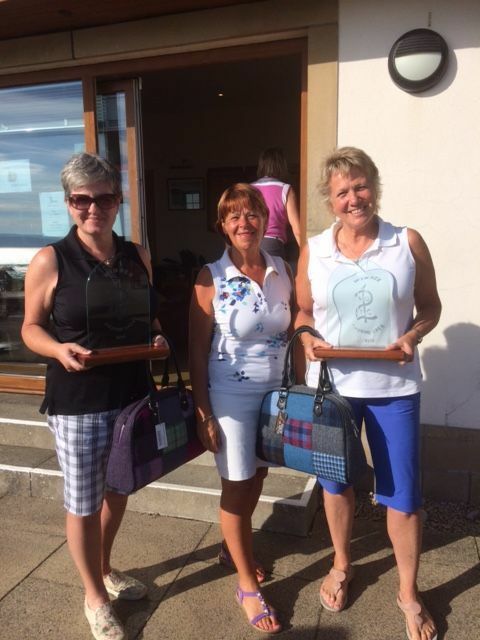 The trophies were presented by Jim Henderson whose nieces, Lorna and Denise, donated the scratch trophy last year in memory of their mum, Morag. Wednesday July 25, Stroke 4, CSS 64, par 65, 7 played. 1 Sheena Murchie 79-15=64, 2 Kate McAdam 83-16=67. Scratch, Sheena 79. Wednesday July 25, Summer Cup, 33 played, CSS 64. Christopher MacNeil 83-25=58, ACB, Bruce Jenkins 66-8=58, Bill Donaldson 76-16=60. Scratch, Ewan McKinnon 65. 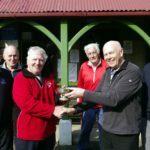 Sunday July 29, Club Trophy, 20 played, CSS 64. Matt Keir 67-5=62, Alistair Hume 74-11=63, Gordon Hendry 69-5=64. Scratch, Ewan McKinnon 67 ACB. Fixtures: Sunday July 5, Brandon qualifier, 8.30am and 12noon. Thursday July 16, Senior Open. Wednesday July 25, Medal. 1 J McGovern 76-14=62, 2 A Napier 72-9=63. Scratch, R Logan 68. Saturday July 28, Crawford Cup. 1 John McGovern 75-14=61, 2 D Logan 73-11=62 and scratch. Fixtures: Saturday August 4, James Bunyan Cup. Ballots at 9am and 2pm. Wednesday August 8, Medal and magic twos, ballot at 5pm. 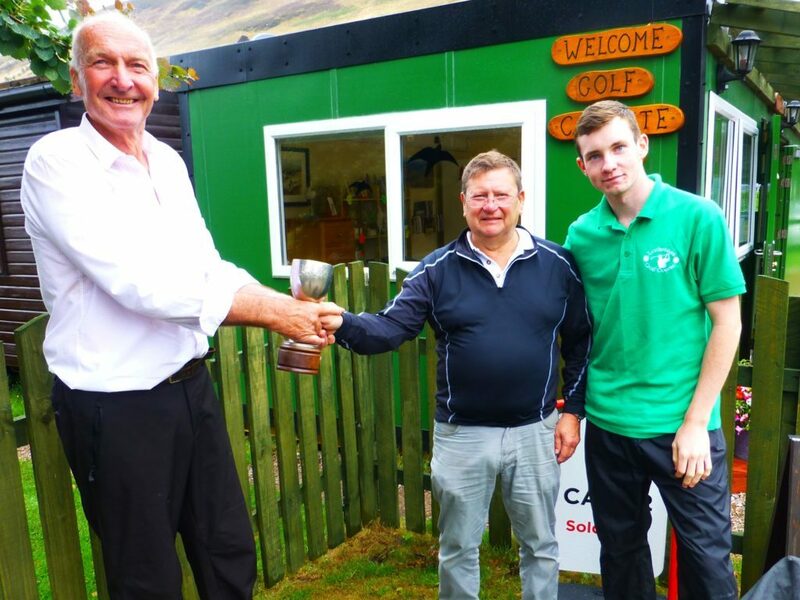 Corrie (Gordon Hendry) v Lochranza Castle (Graeme Andrew), Lamlash (?) v Shiskine (Jack McNally), Champion (Todd Jameson) v Machrie Bay ( H Bannatyne), Brodick (Ewan McKinnon) v Whiting Bay (Jamie Macpherson).